The Ion Age Blog: New Sculptor joins The Ion Age in November 2015! New Sculptor joins The Ion Age in November 2015! There will be a new talent coming into the space opera universe of The Ion Age next month. Dave Foley is a new designer from the United States of America who was so impressed with the idea of a new science fiction setting that offers something different as well as a soul and rewards its supporters that he pitched us an idea. An idea for a whole new range within the 15mm ranks of The Ion Age. Once he had explained it and shown us some concept sketches we were very happy and I am sure that once you hear what Mr Foley will be sculpting that you will be too. Our lead designer Sam Croes has given Dave Foley a free hand to create those miniatures which are not of the Prydian Army, not of the Marcher Barons and not of any Condot mercenary force. In short the non-military. The civilians, adventurers, law enforcement and more of the Prydian Precinct. Humans and perhaps more including robots that will be releasing as themed small packs with single miniature option for purchase. The non-military range will be on its own page of the website beginning in November 2015. We aim to release a new pack into the range every month and we will be beginning with two packs to mark the start of the range and these will be 'Adventurers and Rogues I' and 'Starport Staff'. 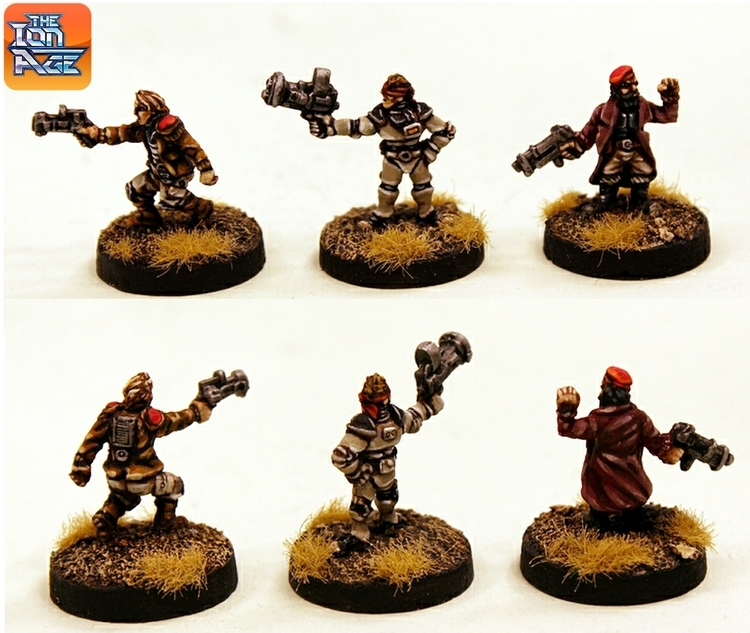 All complete original sculpts by Dave Foley in 15mm scale and suitable for all science fiction settings. Questions and comments are welcome to info@theionage.com. Images in this article are all from the first pack of Adventurers with the header image painted by Sam Croes and the single images painted by Dave Foley himself. Thanks for your comment Zac, good to hear from you. Yes, I think The Ion Age will do another first by committing to such a project. As for poses, just wait and see. Aww yiss. These look great! Thanks Allison. I look forward to seeing your brush work on some of these in the future. Great idea and great work as always. I think the only way I can keep up with you folks is to open up a shop and sell your merchandise stateside. Thanks Ikcinbaz. A few people have commented that we would be better doing Kickstarters to expand quickly but frankly our pace suits most wargamers who want a monthly fix and fun with it. If you do get around to a store I would give you good terms! Welp, I'm in. Those figures are perfect for the more down-to-earth sci-fi future that I'm aiming for on my table. Love the rest of the Ion Age, but the heavy troops just don't work with the rest of my collection. Looking forward to ordering these. Thanks for your comment Warren. Non-military is what we are aiming for and indeed there will be many poses. Its not possible to please every wargamer in every release but I am confident that the feedback here proves the idea is solid. Excellent news, I only really collect non-military ranges. These are right up my street! Thanks for your comment Spacejacker. I look forward to seeing what your brush of talent does to these miniatures when the time comes. We could make that sculpt the favourite customer of Happy Burger! Welcome to the fold Dave and I am sure everyone will love your work, you have a talent that shines through. Positive and constructive remarks are always sought after. Free Worldwide Shipping Offer until 16th April plus get the new Skylark Patrol Flyer at 25% off! Pugnus Light Tank and Manus APC Khanate 15mm vehicles released! IAF101 Taranis Wheeled Main Battle Tanks 5 Variants now released! IAF029 Skylark Patrol Flyer MkII released! IAF165 Desteria Demi Charlie close combat heavy knights now released! IAF081 Taranis Runner Drones released! Taranis Tracked Tanks ESO now over! IAF100 Taranis Tracked Tanks Painted! Near a thousand years has passed since the galaxy brought itself to the brink of extinction in the Wars of the Khanate. Dragon ships burned a thousand worlds and humanity sank to its knees amid the ruins of its once glittering stellar commonwealth. At the battle for the Aldan star system the Ban of Prejudice was lifted and for once the liberated soldiers of the Free Companies stood shoulder to shoulder with the gene soldiers of the sterile Imperial Commonwealth; mankind once more united to stop an overwhelming alien threat. A billion men and woman died fighting and the matter gateway on Aldan IV newly built by the Khanate spewed forth legions from across the galactic plane at a rate that even the fanatical Templars of the Free Companies could not halt. It was then, according to the scorched records of the Starvaulters, that the Templars committed the greatest act of treachery even committed upon the body of humanity; creating the Dolorous Expanses. Whole star systems vanished and were replaced with impenetrable clouds of dust, covering dozens of light years each. An artefact of ancient design in the Aldan system, discovered by the Templars but kept secret, the Dolorous Expanses ended the wars at a stroke. Death and destruction beyond toll, changing the very face of the galaxy and all was still; the Free Companies cast out the Templars and the Imperium retreated into its shattered self. The Khanate...gone…for the time being. Dark times followed and the fate of mankind looked grim, starvation gained hold and commerce fell to the wayside, as few starships could navigate the Dolorous Expanses and contact with the clouds meant instant obliteration. Inhabited worlds tortured their peoples in desperate acts of accelerated terra-forming; needing the land to feed themselves now that commerce was gone. The once zealot and fanatical Free Companies settled into an agrarian civilisation of fifty worlds bonded loosely by their ruling Barons, those of the Free Companies who had retained the armour and weapons of the mighty Crusader regiments. On worlds such as New Glastonbury and its orbiting Tor these Barons consolidated their powers and on the whole were good to their people, they needed to be; too much had been lost already. Centuries passed and the region of space containing these green and pleasant worlds became known as the Prydian Precinct. Each stellar system looked to itself for sustenance and as technology returned the mighty starships refined their engines and learned how to use the titanic power of the Ion to generate intense magnetic fields and transport themselves instantly from one system to the next avoiding the deadly 'Dolo Clouds'. The need for a collective leadership became clear once more. The core systems of Prydian space elected a council of Barons, who became the Aeddan's, to lead them and from among their number a titular head was chosen; a king to act on the behalf of all. To prevent the possible imperial ambitions of the past no standing army was allowed to be in the hands of the Aeddan Council or the King who resided on New Glastonbury. Each system would tend to its own needs to fend off pirates and mercenaries who did not respect the King's laws. Allotted to the Aeddan and the King were the million strong Starvaulters, an armed retinue to police the Prydian Precinct, but with no authority or desire to interfere with the Barons and their worlds; their impartiality was all that kept a vital respect for their judgements in matters the Barons could not agree upon. For a time this arrangement worked and then war once more threatened the worlds of the Prydian Precinct, and war required troops. Millions of soldiers dressed once more in the augmented armour of their forefathers once more took to the field of battle on a hundred planets and countless orbiters and asteroids. It was in war that disaster fell, King Cyon III was killed, and he left his infant daughter in his place. A mere babe could not administer the needs of the Aeddan and their billions of charges, a guardianship was needed. The duty fell to Reckart Nevall a mighty Baron known as the 'Kingmaker' but his guardianship was not greeted by all with joy, over the fifteen years that followed two great camps grew within Prydian space and the Aeddan council split in twain. A minor Baron whose world Kendal III was poor but populous brought the building tension to a head. Baron Kacj Dace rebelled against a judgement of the Starvaulters and called upon the Marcher Barons of the outer systems of Prydian space to assist him. This they did, seeing the Starvaulters as nothing more than Nevall's retinue to ensure his false control of the Aeddan Council. Naming themselves the League of Canlaster they elected Prince Edmund Bluefort as their rightful heir to the crown of Prydia and attacked Kendal III destroying the small force of Starvaulters on the planet. This single act ignited a civil war, a conflict the largest seen by the worlds of Prydian space for centuries. Nevall reacted with rage and called on the support of his own Marcher Barons to control the now teenage Princess Daphne Cyon and the throne she represented. He headed the League of Yordan named for his home world. The first battle of the Prydian Civil War was fought on Kendal III, many more soon followed. An elite strike force of Starvaulters stole Princess Cyon from Nevall's grasp and spirited her away to New Glastonbury where they now reside in force. It is now the twelfth year of the Civil War and after suffering terrible setbacks and defeats the white and red uniformed troops of the Prydian Army have gained new vigour and are pushing the Leagues to their limit. Led by the veterans of the Starvaulters and driven by the Code Gallant the now adult Princess Daphne Cyon has promised to liberate each and every world in the Precinct and return it to the safe holding of the Addan Council. This she is doing to great effect and none in the Leagues seem able to prevent the cheering crowds and the flocking to the banners of the Addan. The Civil War might be nearing its end and for many this cannot come soon enough. Rumours abound about the ever increasing numbers of Muster and Retained along with some of the shining lights of the Starvaulters being sent to the remote Carmarthen star cluster. Some have hinted that perhaps the Leagues are not the prime threat to Prydia and something else, something terrible lurks at the edge of Precinct space. An ancient enemy that all the preparation and new vitality of the Prydian Army may not be able to halt. Do you want to liberate worlds held by the Marcher Barons or resist the advance of the Prydian Army? Or do you dream and fear of what is occurring in the remote Carmarthen star cluster? Welcome to the Ion Age!